[JAN. 14, 2003] The speech team from Lincoln Community High School participated in the Jan. 11 Snow Bowl and placed first as a team. "This weekend was a wonderful morale booster," said Carrier Schreiber, co-head coach of the LCHS team. "After having several weeks off, the students really stepped up and did what they needed to in order to be prepared for this tournament." 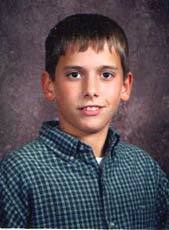 [JAN. 14, 2003] Nick May, son of Scot and Stacy May of Lincoln, won the geography bee at Zion Lutheran School recently. The school-level bee, at which students answered oral questions on geography, was the first round in the 15th annual National Geography Bee sponsored by the National Geographic Society. Nick will join winners from other schools in taking a written test. Up to 100 of the top scorers will be eligible to compete in the state bee on April 4. State champions are provided an all-expense-paid trip to Washington, D.C. for the national championship in May. Michelle Eack, daughter of Kevin and Cindy Eack of Lincoln, was the runner-up in the Zion bee. Amanda Podbelsek, daughter of Dan and Ann Podbelsek of New Holland, took third place. [JAN. 7, 2003] Among this year's Illinois State Scholars are 28 students from Lincoln Community High School. The Illinois Student Assistance Commission has announced the names of those honored in the program, which recognizes high school students in the state for outstanding academic achievement. Illinois State Scholars from Lincoln Community High School are Megan Boyer, Elizabeth Brooks, Justin Bruns, Erin Clark, Amanda Davison, James Ewins, Kirsten Gandenberger, Tyler Gehlbach, Thomas Gramley, Amanda Harmsen, Chelsea Jones, Brandon Judd, Jerrod Marten, Deborah Martincic, Sara Matthews, Lydia Moehring, Michelle Rogers, Abrigail Sasse, Miranda Schumann, Amanda Shelley, Lindsay Struebing, Gerardo Valdes, Adam Voyles, Collin Voyles, Deamondo Welsh, Jennifer Whalen, Eldon Wiggers and Melissa Windham. Students ranking in the top 10 percent of the state's 135,600 high school graduating seniors are named Illinois State Scholars. Rankings are based on a combination of test scores from the ACT and SAT I and class rank at the end of the sixth semester in high school.